As the 2019 general elections gather momentum, the possibility of a smooth conduct of the polls in Imo is remote following problems raised by Pro Biafra groups insisting on a sit-at-home order on the day the National Assembly/Presidential will hold. This is coming against the backdrop of Monday clash between the IPOB and security agencies in Owerri which may likely affect the turnout of people in the forth coming polls, meanwhile the city of Owerri was on Monday electrified by violence as the Indigenous People of Biafra (IPOB) and Security agencies clashed in the capital city. 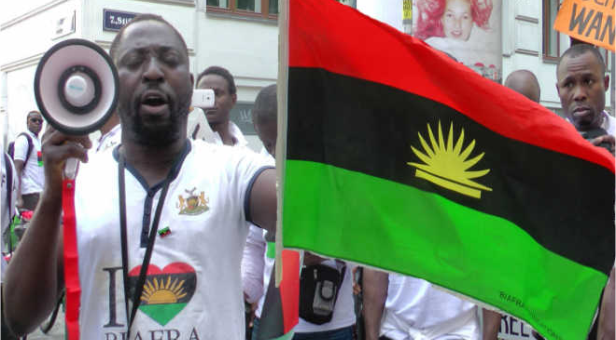 The incident was tragic as gunshot sounds deafening the ears of commuters, passengers, and residents of the affected areas in the state, as pro Biafra groups threatens National Assembly, and Presidential elections. According to an eye witness living in Orji area, Trumpeta gathered that at about 7.30pm in the evening of the fateful day series of gunshots were heard, people scamper for safety, there was tear gas everywhere, one person feared dead, with many people injured, adding that commuters has no option than to source for alternative routes in the nooks and cronies to get to their various destinations, leaving the main road deserted. Meanwhile, it will be recalled that the IPOB group has earlier sounded a warning to South Easterners to boycott the forth coming elections by observing a sit at home otherwise known as “referendum”, this in quote is not farfetched from the cause of the violence.